A northern New Brunswick man with a passion has sculpted a whole new world — from wire. A northern New Brunswick man has created a whole new world — from wire. Guy Cormier began twisting metal wire three years ago as a way to "make something with almost nothing" and discovered a great talent for sculpture. "I've always been artistic, but this pushes me more and I have a lot of fun doing it." Guy Cormier says he suffers scratches, pokes and sore hands but being a 'wireologist' is his passion. 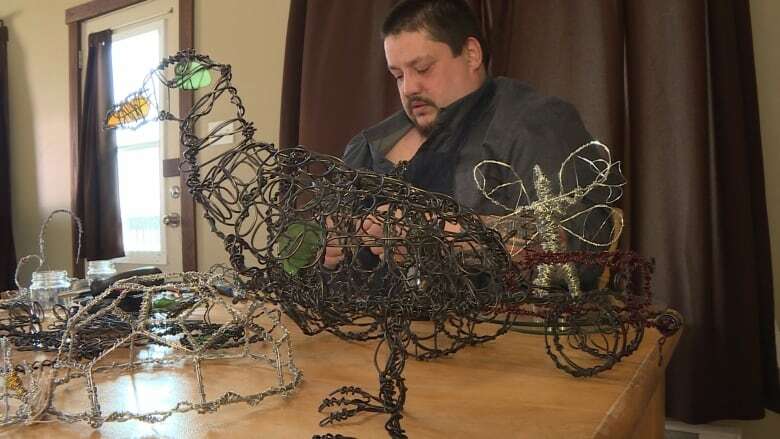 (Bridget Yard/ CBC News)To date, Cormier has created hundreds of sculptures, including motorcycles, boats, scorpions, and entire families made of wire and rope. He's been asked to create special pieces for clients, including crucifixes, which he now makes regularly. "I started talking with people and everybody has an interest in something," said Cormier. "Crucifix cross, skates, hockey players, a fiddle, guitars, cake, all kinds of stuff. Around Christmas I did a lot of ornaments. It's something special that people want to encourage me, and something they can use in everyday life." Cormier is so enthralled with his hobby that it has become a passion. He wakes up in the middle of the night to work. Cormier was recently asked to construct a basket for a child's headstone. The requests are varied, but each one is special to him. Calling himself a "wireologist," or "brochologue," he sells his wares online and in small boutiques across northern New Brunswick. The work isn't easy, though. Cormier has taken to wearing a tough apron to shield himself from the sharp wire. "I work and my hands hurt, and I poke myself in the face, ears, belly," he said. "It's the price you pay to be a wireologist!"